I know the day is almost over, but I wanted to post my card that I made today for the sketch challenge on SCS. It was a very fun and unique sketch with the 1/4 circles! I used another Artful INKables stamp from the Birthday Best set. I just love this yummy cupcake! I paired it with this dp which I also love from Making Memories called Chloe's Closet which you can find at Michaels. 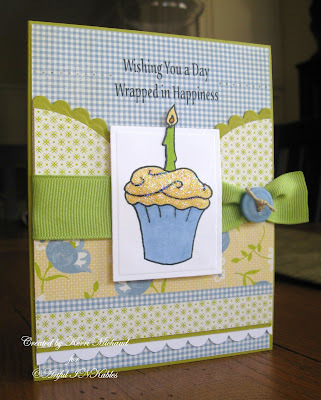 I stamped the cupcake twice, then cut one out with my Rectangle Nestabilities~cutting off the top of the candle. I cut the candle off of the other cupcake and adhered to the top of my original image to create the out of the box look. The image was colored with Copics to match the dp, and I applied Stardust Stickles to the frosting. I added the ribbon, and tied twine around it and through the button to attach. I stamped the sentiment also from AI's Birthday Best set and added some paper piercing on either side. Thank you so much for stopping by today, and I hope you got entered into the fabulous drawing to win all 4 new stamp sets! Love these colors, Kerri - and the shimmery cupcake is sooo pretty. I love your ribbon/button treatment too. Cute card! How yummy yummy and so pretty too! I LOVE this card! The colors and patterns are so soft an perfect and you made your cupcake look like is can with the dp. The glitter is a great touch too!